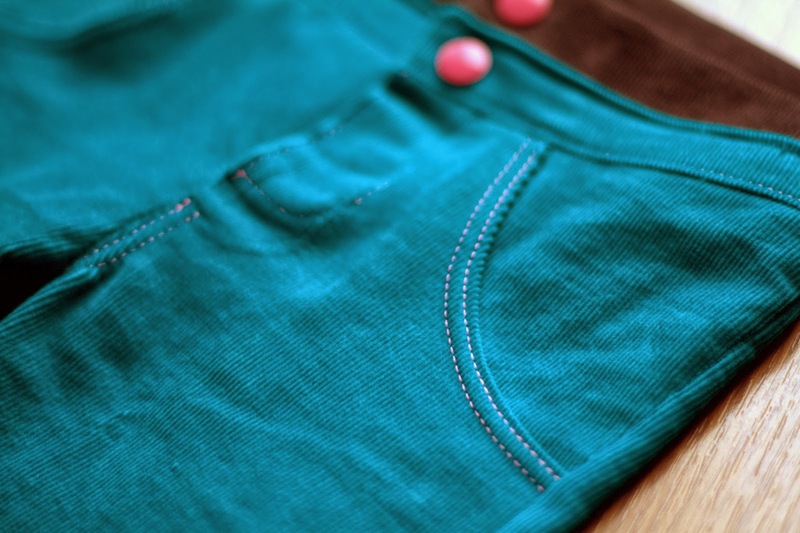 I've had this teal corduroy fabric for months now with the intention of making pants for PiePie with it and I finally did! This was the first time I've ever sewn pants with a fly... and based on how things went, possibly the last! They did turn out pretty cute, but were quite a pain to make. I'm a bit of a perfectionist and these pants just aren't perfect. So don't look too close! 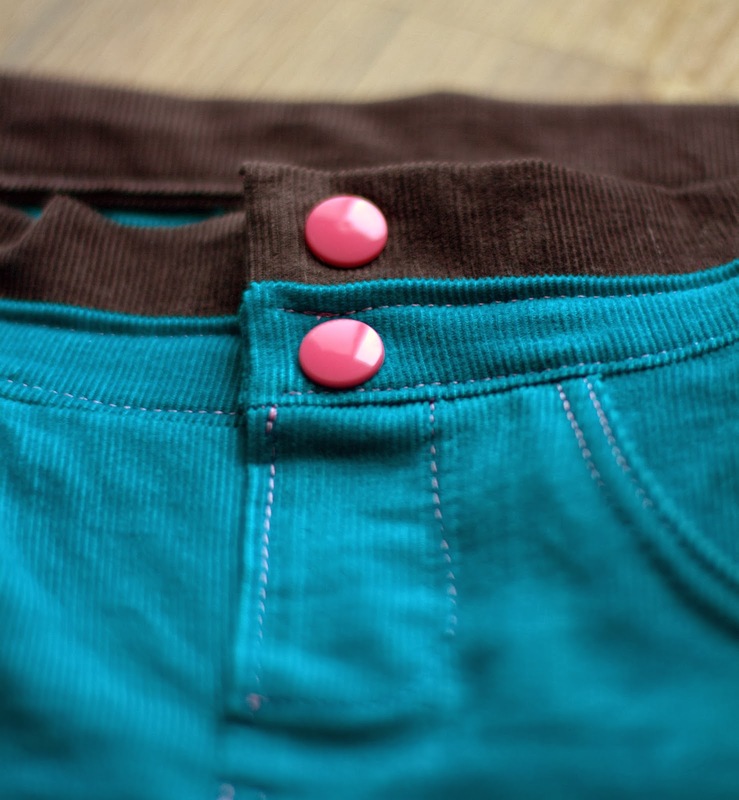 Like the dual color waistband design? Well, that wasn't really a 'design choice'. 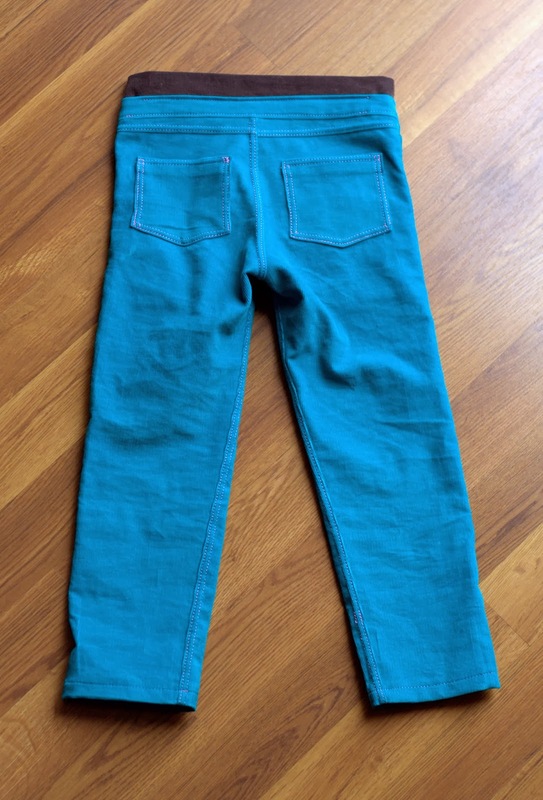 I ran out of the teal corduroy and thought I could get away with using a thinner waistband, but that didn't quite work out. So I had to add the gray corduroy later. 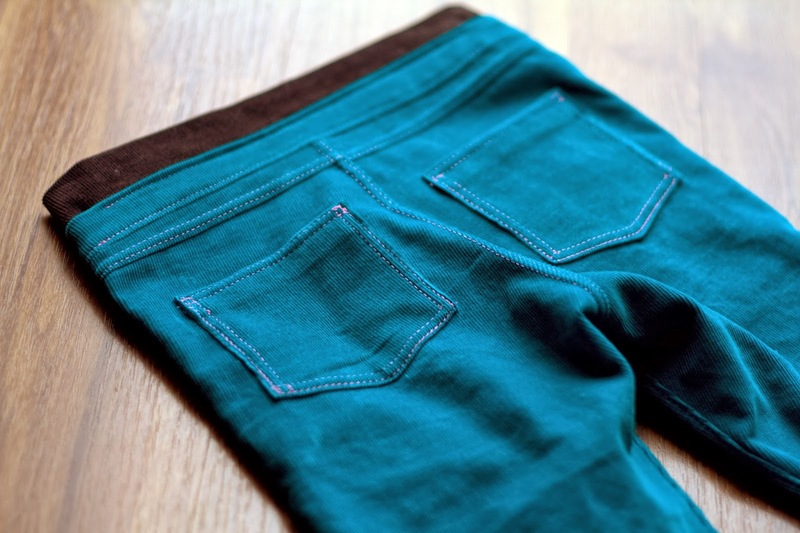 I do really like the front pockets and they were simple to make. 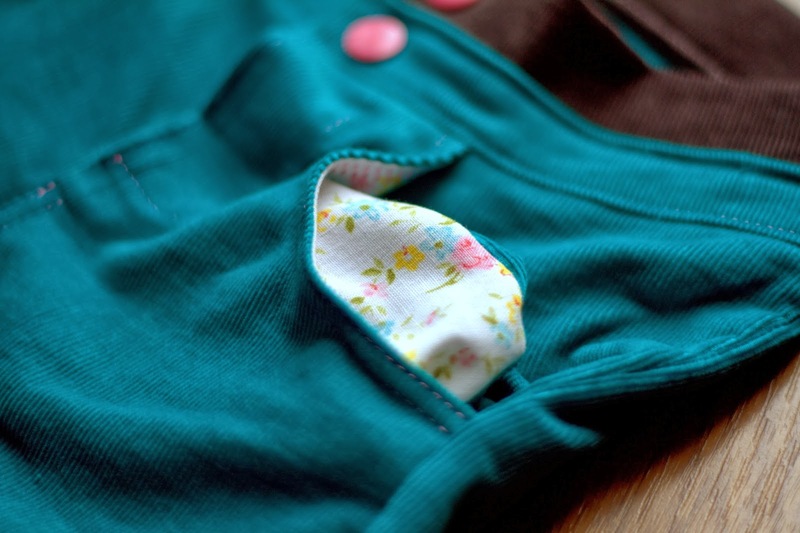 I used this pretty fabric for the inside of the pockets to match the Izzy Top that I made previously. Again, I used snaps for the closure. Are we noticing a trend here? I actually do have several colors of snaps, but always seem to end up choosing pink. The fly was the biggest issue I had with these pants. As I said above, I've never sewn pants with a fly, so I had no prior knowledge of how to construct them. The pattern tutorial had very minimal instructions and pictures for this part, so I'm pretty sure I didn't do it correctly. Let's just say I'm only going to show you this much of the fly, because the rest is not pretty! 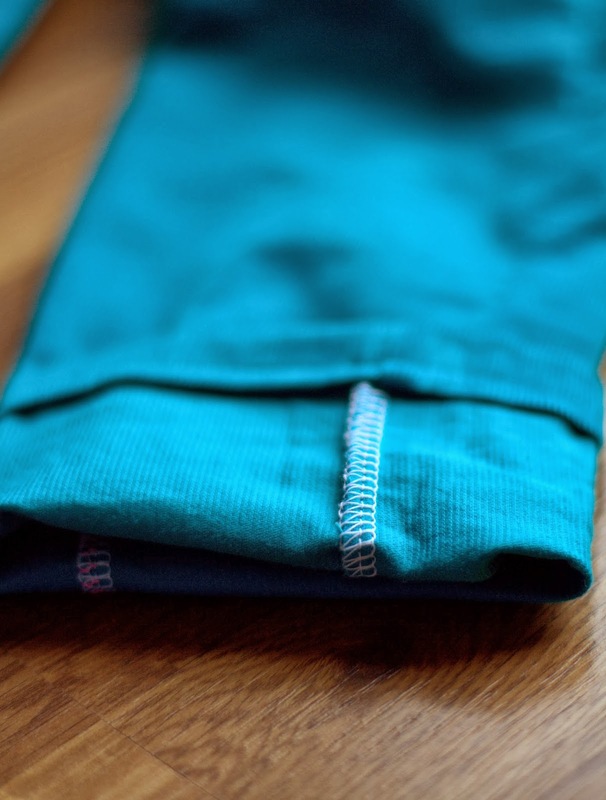 I got to use my new serger for this project and I just love it! 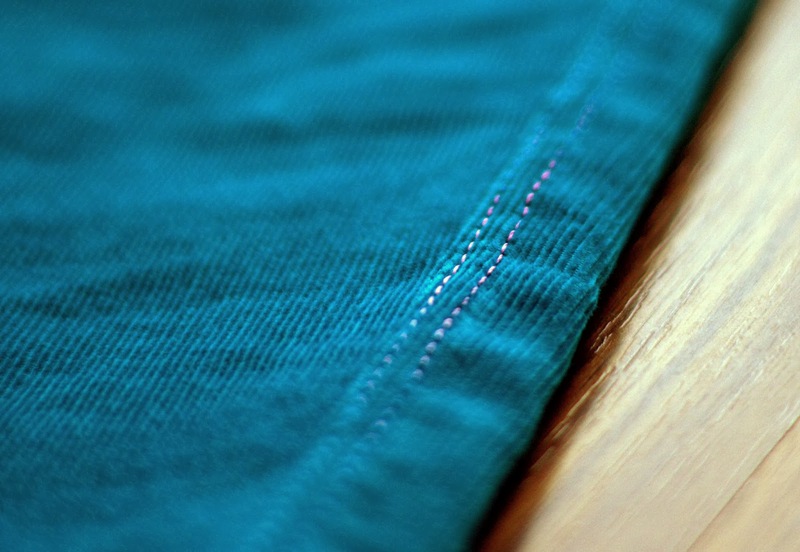 I used a twin needle to achieve the look of double stitching. I'll tell you that that thing was a pain too! The threads kept getting tangled and breaking. Definitely not fun! 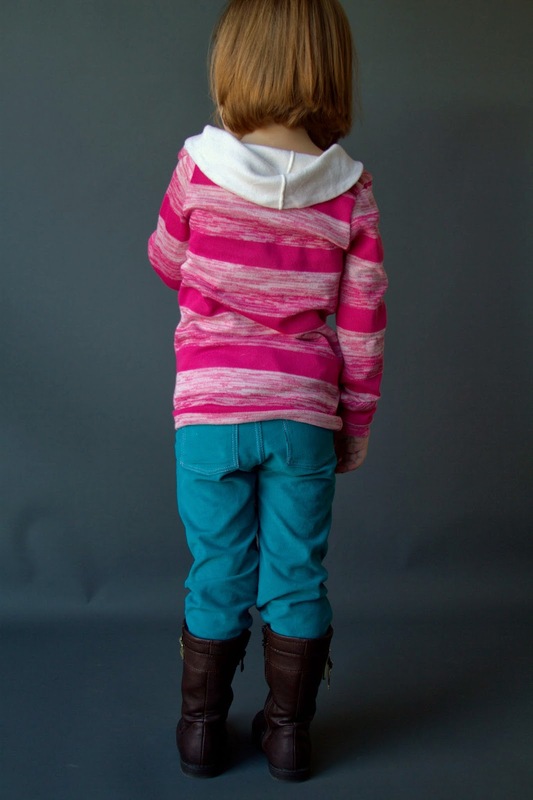 The pattern I used for these pants is the Skinny Jeans pattern by Peek-a-Boo Pattern Shop. 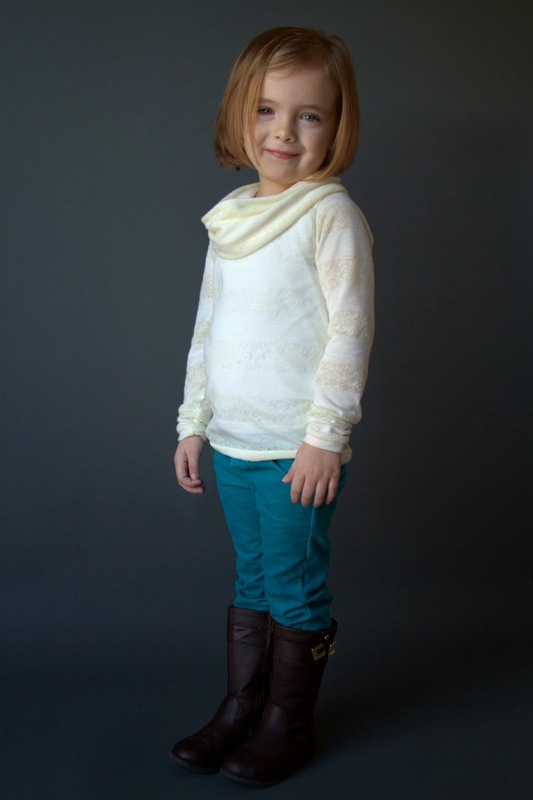 This pattern comes in sizes 12m-10. I did not notice a recommended skill level on the pattern by the designer, but I'd say this is an advanced level. 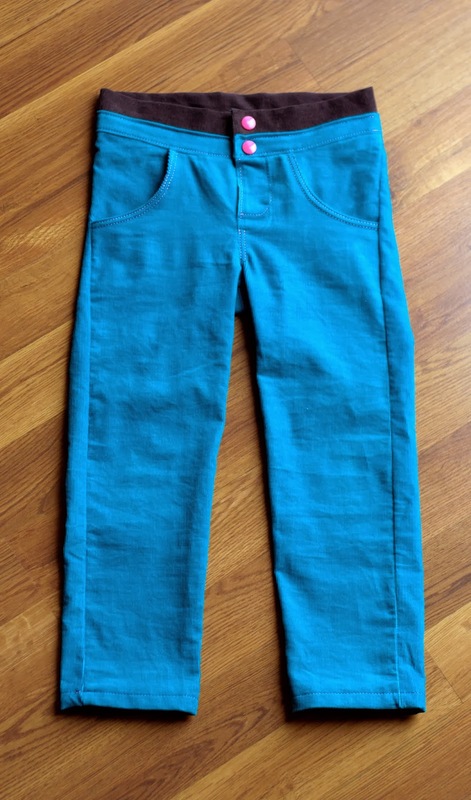 I wouldn't recommend it for someone (like me) who hasn't made pants before. In the end the pants did turn out really cute, but were quite complicated to make with limited instructions for some of the more difficult parts. I LOVE how that dual waistband! I think sometimes those "oops" moments make some of the best garments! I'm loving your site too. I'm going to have to keep reading! Haha, glad you like my little mistake! It does make them a bit more interesting! I'm obviously just getting started with this blog and trying to figure things out. Thanks for reading! 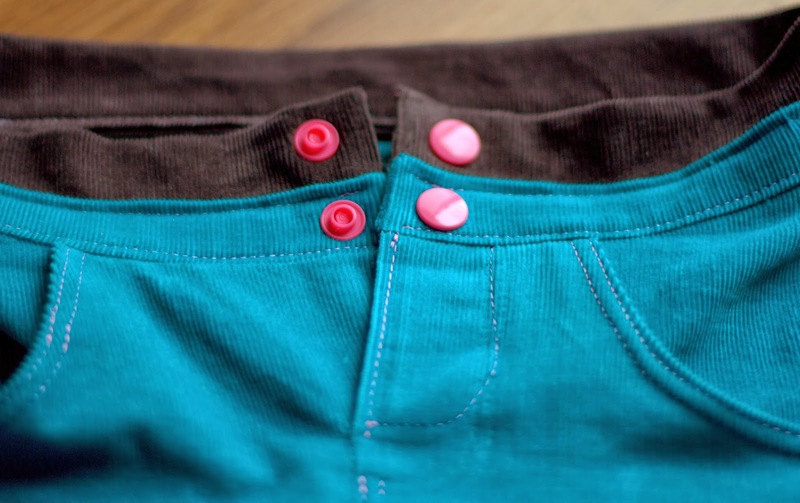 I haven't attempted pants with a zip fly yet either. I want to learn to do that one day. 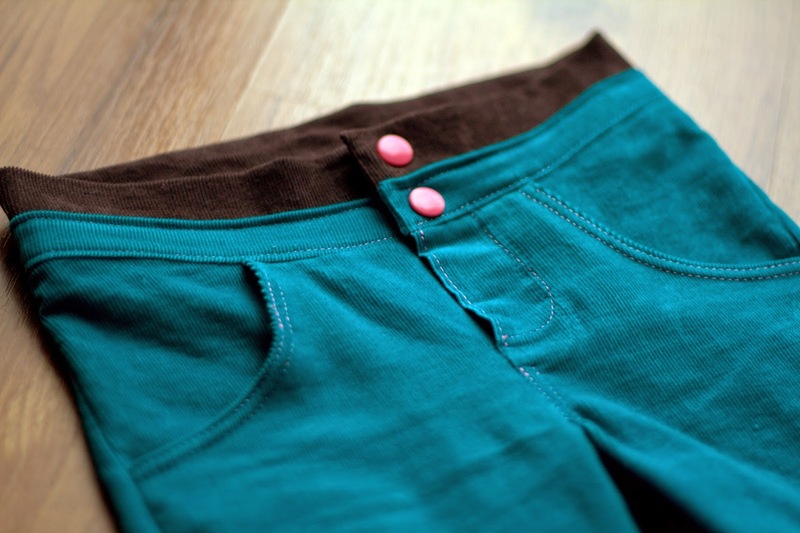 Right now I just make pants with an elastic waist using Dana's free pants pattern and tutorial from danamadeit.com. 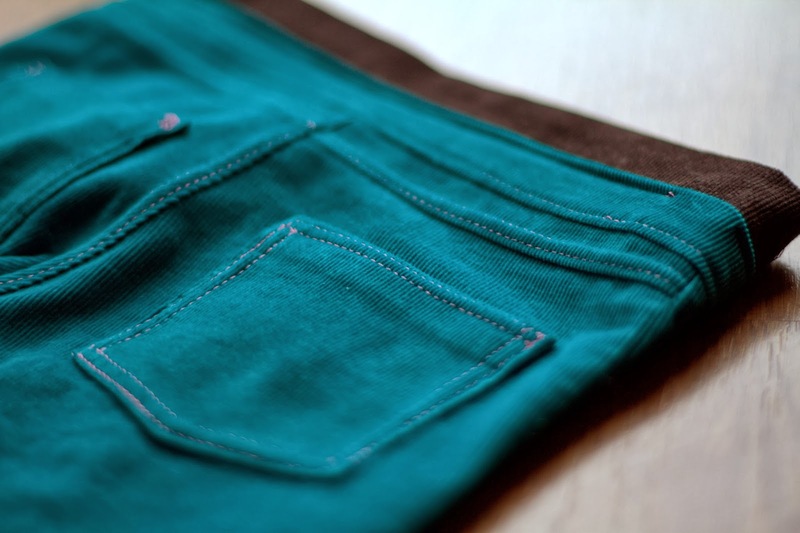 I love the teal corduroy you used for the skinny jeans. They look adorable! Jackie - I'll have to check that pattern out! I'm definitely not planning to attempt pants with a fly again for a long time!